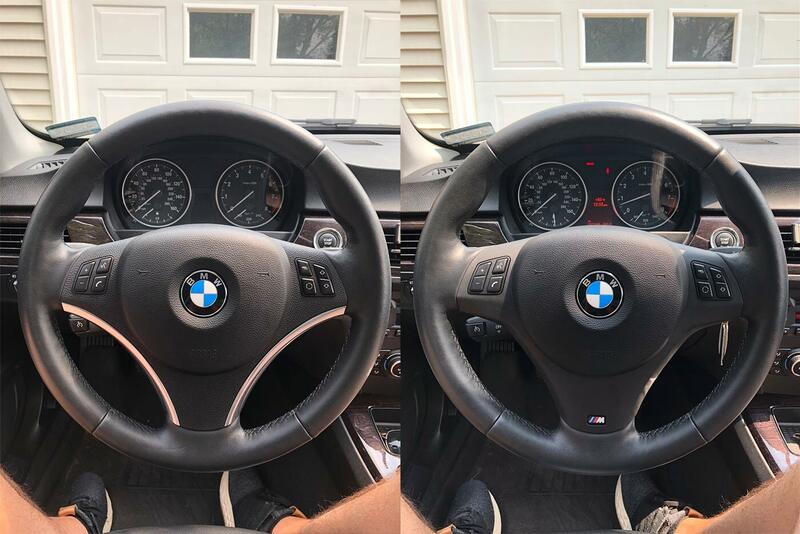 What's the deal with M3 Steering wheels? BMW 3-Series (E90 E92) Forum > E90 / E92 / E93 3-series Technical Forums > Cosmetic and Lighting Modifications (exterior/interior) > What's the deal with M3 Steering wheels? It's wearing (not awfully) but it would be nice to replace it with a nice upgraded one. And there are so many options, it seems like multiple models. Which ones can I use as a plug and play? So long as you already have the sport wheel, then any OEM M3 wheel will work just fine and everything will swap right over. Something to note - if you have the heated steering wheel option, none of the M3 steering wheels are heated, just so you know. I would suggest looking at Coby Wheel at $225 for a refinished Alcantara wheel with core exchange. It's not heated ... so I see that some wheels it looks like you just replace the "horn area" and others looks like it doesn't come w/ that faceplate w/ the buttons. So for me I have the option of using my faceplate as well? It seems like there are so many variations. Options 2 through 4 are all interchangeable. The only caveat is to make sure you are getting an automatic or manual steering wheel to match what transmission you have to avoid unnecessary work. Any of the steering wheel controls or trim covers are completely interchangeable between options 2-4. If you just get a wheel and nothing else, simply swap over your current trim and buttons. It doesn't take more than 15-20 minutes to do the full swap over. Pulling the old wheel out, removing the airbag, swapping over all buttons and trim and reinstalling the new wheel can easily be done in about an hour. I'd also add that options 3 and 4 have a slightly different steering wheel cover trim. it's a bit more chiselled than the rounded regular Sport steering wheel ones. See the photo below, the M Sport one is more of a angular shape as it wraps around the buttons towards the center lower spoke. The Sport one curves all the way through. Yes - this is true, although both will cinch down tight on any of the wheels in question. Ok .. I'm getting confused on the M Sport and M3 wheel I believe. What do most people end up going with? Very helpful. And how do these compare to my sport steering wheel? Material and dimension wise? The M-Sport and M3 wheels are the same thickness. The M3 wheel is smooth nappa leather and the M-Sport wheel is smooth nappa and perforated leather. The M3 wheel also has the tri-color stitching. The standard sport wheel is grained dakota leather and a little bit thinner, but not so much as the base wheel. All three wheels are 370mm in diameter (about 14.5 inches). Note that the M-Sport and M3 steering wheels do not have a heated option, so if your current steering wheel is heated, you will lose that feature. If you want to retain that feature, then the next option is to have it recovered in nappa leather like the M3 wheel. This is what I ended up doing and was very happy - cost was about $200 or so. What's the cheapest option here? I am not sold on necessarily an m3 or msport wheel vs my sport wheel, but since my sport wheel is wearing .. what is the cheapest or some of the "cheaper" solutions?